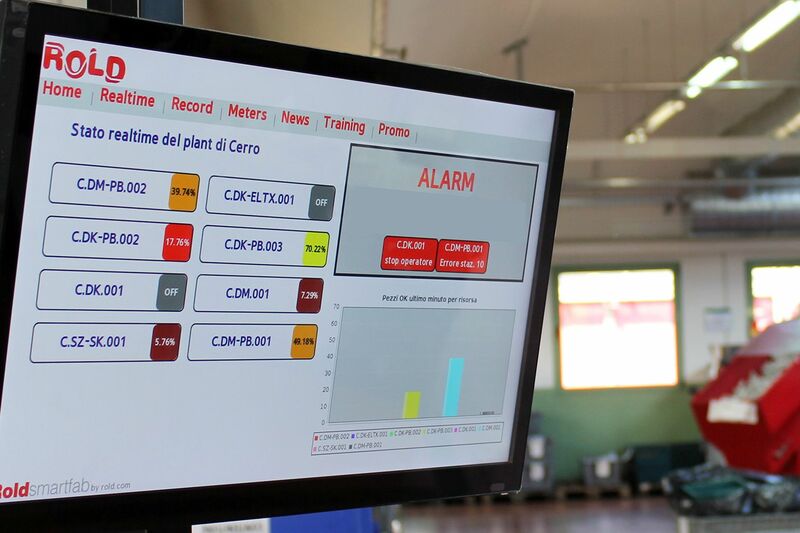 The headquarters of Cerro Maggiore di Rold was the second stage of the tour “Ricomincio da … 4” – the project organized by Federmeccanica, Federmanager and Fondirigenti, to in-form and sensitize Managers and Entrepreneurs on the topic of Industry 4.0. Landmark in the field of components for home appliances, ROLD has made innovation and technology its winning factor and has invested also in sectors parallel to its core business, such as Industry 4.0 and Energy Efficiency. It is news of a few days ago that ROLD was included in the list of the World Economic Forum as Faro Plant (Lighthouse Plant), the only SME selected to be a showcase of innovation. Is the digital manufacturing too complex to be implemented in not big-size companies and equipped with machines for the standard manufacturing? Rold’s answer is no. The digital transformation of a factory is an unavoidable fact and today there are accessible and simple solutions that allow exploiting the advantages of Industry 4.0, gaining competitiveness and efficiency. Rold has developed the Smartfab platform that allows digitizing the production quickly and easily, connecting the machines (even not state-of-the-art ones) and drawing data in real time, useful for a more efficient management of the factory. To do that, the platform is coupled with Samsung devices of commercial type that allow undertaking the digital transformation without excessive costs and very articulated systems. We have talked about that with Paolo Barbatelli, Chief INnovation Officer Rold Group, who has illustrated the characteristics of the platform, initially designed for internal use and now proposed also to other realities of the manufacturing industry after the establishment of a dedicated business unit. What are the peculiarities of Rold Smartfab? Rold Smartfab is an application that on one hand allows connecting the productive resources, on the other hand relying on a very smart system of data presentation and management, using devices of commercial type not specifically created for the industrial world. In designing the platform, we have adopted a pragmatic approach: the idea of Smartfab is implementing a production tool that can be used very quickly and with a set of targeted information for manufacturers. The possibility of using commercial devices such as interactive smart watches or touch displays is relevant, because it allows making the production digitalization more accessible and also more understandable and manageable. The choice of using devices by Samsung (company of which we are component supplier, too) was made precisely thinking of appliances of the everyday technology, less expensive and complex than industrial ones. What can a company do with Smartfab? We define Smartfab as an entry point for Industry 4.0. Many companies like ours, in fact, need a simple and fast tool to start digitizing their productive site, connecting machines and drawing from them data that are transmitted to the cloud and made available by means of digital devices like displays and smart watches. The advantage of adopting these tools is that people (not only youth) use them in their daily life. Precisely the acquaintance with these devices facilitates their introduction into the factory, because a particular alphabetization is not necessary. If we consider the smart watch, it is a product conceived for the consumer world, but the most recent versions (like Samsung Gear S3) feature suitable characteristics for being applied to the industrial world: they have batteries that can last even a couple of days and high sturdiness degree (protection against water and dust); besides, the smart watch is a wearable device, a comfortable solution because it is not cumbersome and leaves hands free. This device enables interactive messages about the machine operation: it is an item that allows “connecting” with the production in real time, saving time and resources. To describe a concrete case, the smart watch can for instance vibrate and warn the operator when it is necessary to intervene on a machine (a station), allowing him to act simply and quickly. Rold Smartfab constitutes therefore a first access point to Industry 4.0 and in a second time it enables the implementation of more complex monitoring logics. 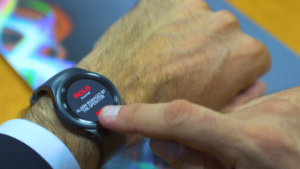 With Rold Smartfab it is possible to use commercial devices like smart watches to enable the interactive messaging in the factory. As far as the display use is concerned, what is it possible to visualize with Smartfab? We have preferred making Smartfab a really “agile” tool, then we have decided to make available the most critical information needed to manage the production in real time (for instance, efficiency of the machines, quality, rejects, downtimes, control of energy consumption, of phase displacements and pneumatics, factory’s alarms). It is a highly targeted set of information, where we have exploited all of our experience as manufacturing company: Smartfab was born from those who “live” production daily. How do you connect machines? Machines are connected through the possibilities they provide: if a machinery is equipped with sensors, we read those devices; if a machine has a PLC, this instrument is used for the connection. We have taken into account the fact that, in companies, very modern machines generally operate side by side with others, more conventional: for this reason, we have built our middleware using technologies that can connect also machines that are not state-of-the-art but it is necessary to monitor. Smartfab’s task is creating a “homogeneous layer”, in which a one-month old machine can live together with another that is twenty years old, enabling both to draw the same type of contents. In addition to the middleware, we have designed the data warehouse, which is in cloud and feeds the various dashboards inside some displays. Do you use Smartfab in your factory? The first reason for which we have created the platform is just the possibility of using it in-house. What has happened later, i.e. the setup of the business unit Rold Smartfab, is a result with which we are obviously very satisfied, direct consequence of an escalation of contacts and attention paid to our solution. We are arousing great interest in our digital course, not only in companies like ours but also in our customers. This is a very positive “repercussion” in terms of reputation, today judged an added-value in the industrial world: our customers do not consider us exclusively as a supplier of components, but as a partner in the innovative and technological field. In several occasions it happened that, also in contexts shared with other suppliers of the chain, we were requested by our customers’ top management to explain our digital course: this is a great satisfaction for us, even more because unusual. How much does innovation matter in the growth of your turnover, which in the last 4 years has reached the best performances in over fifty years of history? Like all, we have lived critical periods, too, especially in the worst crisis years. Nevertheless, we have started again the innovation course, research and market activities, and since 2012 onwards we have always scored growing results. In 2009, we had reached a turnover of 28 million Euros and, in 2016, we scored 42 millions: this situation has increased the capability of reinvesting profits. Even if I think there is not an index to measure with an absolute value the relation between business growth and innovation, I believe in the connection between these two elements. Certainly, factors like the collaboration with Milan Polytechnics, the research and the digitalization course have created a fertile ground for the company’s growth. Besides, I can acknowledge that Rocchitelli brothers, who wanted me in the Board of the Group, made a noteworthy choice in the past, choosing as top manager a professional outside the strictly manufacturing world. Daring to create “contaminations” at a level of the organization that can intervene on business strategies and on investments is a risk factor but certainly an opportunity, because it allows travelling unexplored ways and implementing new projects. To become an Industry 4.0, is it necessary to rely already on a digital development basis inside the company? Before dealing with the digital development, it is necessary to develop advanced manufacturing competences. We have created Smartfab after applying, for at least 3-4 years, methodologies such as Lean Manufacturing and Six Sigma: it is an irremissible stage. To accomplish the transformation into factory 4.0, the steps are many and some of them are cultural; an important aspect is to enhance the digital culture of the top managers who operate in manufacturing companies. We cannot imagine doing Industry 4.0 simply entrusting certain initiatives to computer experts: it would mean that we are treating a strategic operation similarly to the purchase of a forklift or of a corporate car. Top managers and entrepreneurs of SME should, first of all, improve their digital culture to be able to represent an example and a guide for their collaborators. Industry 4.0 is not concentrated on computer systems, it is a matter of mind setting. However, we should not be tortuous, otherwise we never succeed in attaining concrete results. Today, the interesting aspect of technology is that it can be available even at accessible costs. Investing low amounts compared to what are industrial parameters, it is possible to do a lot: what is important and necessary is to follow a gradual course. The steps we must overcome concern the cultural aspect, the one related to competences and then to the digital implementation. If we do not pursue a coherent course, we risk of making a sort of “digital makeup” that would not make difference in the factory. What would you suggest to companies like yours? The course towards Industry 4.0 should not alarm, on the contrary we must deem it as a great opportunity. It is much more accessible than what it might seem, because the real problem is the cultural gap, not the cost. The hindrance is very often the missing understanding of the benefits we can obtain, starting from the “side” effects, such as the impact in terms of reputation. Our German customers have already released some specifications concerning what they call Audit 4.0: we are going towards a future in which the digitalization will become a substantial, irremissible requisite, like quality, and therefore it is impossible to think of not approaching this world. Today the market can be highly awarding for very clever ones but it tends to discard mediocre: the fact of not pursuing certain ways can become problematic indeed. The message I would like to communicate is optimistic: Rold is a medium Italian enterprise, we are not wizards. We are a company that intends to innovate and I believe that, like us, also many others can achieve the same results.